I Updated yesterday gpg4win to version 3.0.2 and now Outlook 2016 32bit (Office 365 ProPlus 1711) wont encrypt or sign messages anymore. With the old version (gpg4win-2.3.4) this was working. If I write a message, check encrypt and send it, I got asked for the key and confirm that and the message was sent. But, its not encrypted. I use an Exchange 2013 Server. Is there any log, anything I can track what is going wrong? Mak created this object in space S1 Public. Mak added a project: Bug Report. From your Log I can see that the encryption was successful. But there is indeed some strange stuff happening with the Outlook state that I have never seen before this way. My first guess is that somehow another addon interferes. Do you have any other addons installed and could you please try to disable them to see if this fixes the problem? I disabled all my add-ins and tested it again. Still the same. Mails are sent unencrypted. This is strange, something in your setup must be different from other users. Any Idea what might be special for you? In your log it looks like only the send event for the encrypted mail is passed. Where do you send your mails to, to another user on the same exchange server? 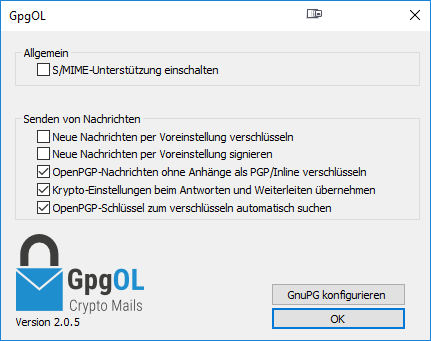 Can you please try to send me an encrypted mail with GpgOL? Maybe I can see something in the actually sent mail. I sent it to a user on a different Mailserver. On my setup its nothing special... Win 10 Enterprise N en, Office 365 Pro Plus en, Kaspersky Internet Security. Server Win 2012 R2 with Exchange Server 2013 and GFI Mailessentials. I installed Kaspersky Total security on one of my test systems and still can't reproduce the problem. Thanks. From your mails I can at least take that there is something non standard going on. The MIME Boundaries are not Boundaries that Outlook would generate and they contain the hostname of your Windows Server, so I guess the MAPI (Outlook's internal data format) to MIME (the internet transfer format) happens on your server and somehow it does not use the encrypted mail. It would be a huge help if I could get a test account on your server, then I could try to figure out more what's going on using introspection tools and interactive debugging. The Language of GpgOL depends on the System locale and not on Kleopatra's language. Any chance that I could get a temporary test account on your Server? I would find it interesting if my Outlook 2016 connected to that server would show the same problem (so then we know that the problem would be with the server). My current best guess is some server plugin or server configuration that is causing this as Mak already ruled out other plugins. Mailessentials is a Server extension, not outlook addon and has no influence to outlook. And as I mentioned, with the previous version that was no problem to sent encrypted mails in the same configuration. My system language is english. I don't think that it is possible to create you an account. @JHohmann Your log is similar in that I can see two Write events after the send of which there should only be one. Somehow we seem to do crypto on a copy mail object and another mail is acutally sent. With an Exchange MAPI connection Outlook and Exchange are very much linked together and the server can influence the clients behavior. At least we can now rule out that the Server creates the problem. My next step will be to add more debug output in the related send code / the duplicated write, maybe that can tell us something. Another question: Any outgoing Filters (Email Rules)? What I mean is called in german "Regeln und Benachrichtigungen" I can imagine that some filtering might interfere. A quick test did not show it for me but it might be something that is different for you. Are there any group-policies, that might affect the behavior of Outlook regarding to GpgOL? My too, no outgoing rules. Ahh, and yes I use a public personal s/mime cert to sign my mails. nothing else. If I disable the option "Add digital signature to outgoing messages" I am able to encrypt outgoing messages. Its not what I wan't, because I want to sing all messages, but hope it helps to find the cause of the error. @JHohmann can you confirm, that this option is active on your side also? Ohh, and it does not help if i deselect the sign option in the message. Wait a second: Do you sign all your Mails ? Even the ones you are trying to encrypt with GpgOL? If I select encrypt & sign with GpgOL and Sign with Outlook S/MIME I'm asked for GpgOL encrypt / sign certificates but the Mail is sent out only S/MIME (by Outlook) signed. This is a bit like you describe here. But the three mails you sent me tuesday were not S/MIME signed. With these Options set and explicitly unchecking Sign & Encrypt before sending I get the exact same behavior that you two describe. Mails are sent unencrypted. Maybe gpgol thinks it should also send it unencrypted if we remove that option? aheinecke added a commit: rO707250ce6151: Add special sauce for Outlook S/MIME code interact. Ok so I found out that you could even trigger this bug without persistent options just by activating and deactivating any S/MIME option on a mail. This somehow changed the behavior of Outlook. I now detect a result of the changed behavior and activate a special trick to send the encrypted mail. As that trick relies just on my experiments and not on documented behavior I only activate it If the changed behavior is detected and not unconditionally. This should minimize the regression risk. aheinecke raised the priority of this task from High to Unbreak Now!. It was really a critical bug and could have been called a Security Issue. I hope to get a Gpg4win release out tomorrow.